A new history of the East Anglian landscape in the light of the recent research which suggests that the old kingdom was reshaped into the shires of Norfolk and Suffolk by King Cnut [1016-1035]. 10.15 The Shaping of the Kingdom of the Eastern Angles. An exploration charting what we can see of the formation and history of the independent kingdom of the Eastern Angles up to the coming of Edward the Elder in 917. 11.30 Danes and West Saxons 917-1016. An examination of the history of East Anglia during the tenth and early eleventh centuries, beginning with a close look at the year 917, when King Edward the Elder is supposed to have ‘stormed through East Anglia’. We shall also assess the extant charter evidence and ask just how integrated into the polity of England this region really was. This session will finish with the reign of Ethelred II ('Unraed') and the impact of yet more Danish raids and invasions. A consideration of new evidence that the process of dividing the old kingdom into the counties or shires of Norfolk and Suffolk did not take place until the 1020s - a full century after the date generally accepted. 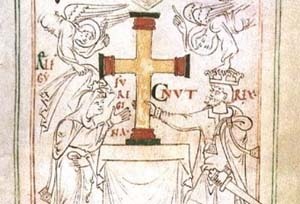 The role of King Cnut and Queen Emma in East Anglia will be investigated and the question of why the process of shiring was important will be addressed. Queen Emma’s role in the region has not hitherto been explored, but it is possible to trace her patronage in the careers of powerful individuals from the reign of her son Edward the Confessor. A reassessment of East Anglian Landscape History in the light of the implications of the foregoing sessions, testing them against earlier views. These include the theory that the territory of the Liberty of St Edmund was formed in the seventh century. Sam Newton was awarded his Ph.D in 1991 and published his first book, The Origins of Beowulf and the pre-Viking Kingdom of East Anglia, in 1993. Since then he has been working as an independent scholar in Early Medieval Studies. His latest book, The Reckoning of King Rædwald, was published in 2003. He is also now a Director of Wuffing Education, NADFAS lecturer, and Time Team historian. Ashwin & Davison (eds), An Historical Atlas of Norfolk (Phillimore 2005). Fairclough, J. & M Hardy, Thornham and the Waveney Valley. An historic landscape explored (Heritage 2004). Rumble, A. [ed. ], Domesday Book, Suffolk, 2 vols (Chichester 1986). Williamson, T., The Origins of Norfolk (Manchester, 1993).